Visit King Tu Duc's mausoleum and enjoy royal music show at Minh Khiem Duong ancient theatre,..
Tuy Hoa is the provincial capital township of Phu Yen Province, about 1 200km from Ha Noi Capital, 600km from HCM City. 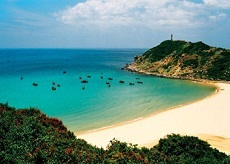 Tuy Hoa is situated on the banks of the mouth of the Da Nang River. The river’s length about 300km and its source starts in the Central Highlands to the west of the province. The river’s width is between 1 and 3km. The bridge spans connecting the Da Nang River and the township to other side. 51, Road 4, Him Lam, Tan Hung ward, Dist.7, Ho Chi Minh city, Vietnam.